I’ve had a Lamy before. It was an Al-Star with an extra-fine nib. I HATED it. So, when I received this pen I had my reservations, but I was determined to give the pen another try. “Many people swear by these pens,” I thought to myself. Perhaps it was just MY Al-Star. Upon first glimpsing this Vista I discovered two things: first, I loved the way the clear pen looked as opposed to my Raspberry Al-Star (I don’t even like pink. How did I end up with a Raspberry pen?!) and second, I much prefer the acrylic over the metal. It feels better in hand. After giving the pen a good cleaning (it had a dried out blue cartridge left in it) I was able to better assess the look of the pen. The clear acrylic is a wonderful choice for a pen of this design. I found my old raspberry colored Al-Star to be a bit too angular and harsh. The transparent clear acrylic softens the lines somehow. The silver accents (inner cap, nib, clip, barrel inscription, and converter collar) are a nice touch. However, the paper clip inspired clip is not appealing to me whatsoever. The design of the Vista, like the Al-Star, is edgy and modern. The pen is shaped like a squared off cylinder. There is a cut out in the barrel so that you can see the ink level (though I don’t know why you’d need such a thing with a demonstrator pen). The cap is of the same shape with a huge clip. The pen is substantial at 5 1/2” capped, 5” uncapped, and 6 1/2” posted. It weighs about 20 grams inked. The section of the Vista, like the Al-star and Safari, has indentation on the sides to assist you with your grip. So, if you are uncomfortable with the “schoolhouse” tripod grip you might not like the feel of this pen. I happen to use the tripod grip, so it’s not a big deal to me. 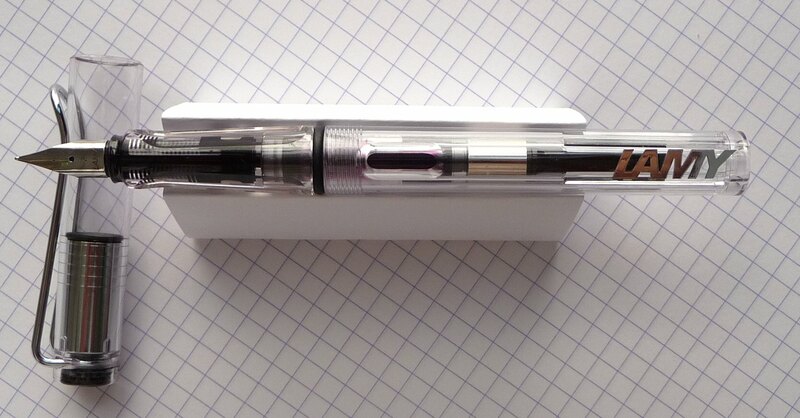 The Vista comes with a stainless steel nib. You can get it in XF, F, M, and B. Most Lamy pens have interchangeable nibs, so your Vista will also fit many of the gold nibs as well as the italic nibs. My Vista came with a fine nib, and to my surprise it is actually very very good and a joy to use. However, there have been many complaints about scratchy Lamy nibs. In fact, my old Raspberry Al-Star’s extra-fine nib was too scratchy for my tastes. See, this is where I have a real issue with Lamy pens, the nib quality is inconsistent. Sometimes you get a great one, and sometimes you get a real dud. Now some will say that it’s not a big deal. Lamy nibs are easily interchangeable, so you can always buy another. Well yes, but the replacements are $11 or so, and there is no guarantee that the replacement will be any better a writer. If you have a chance to try your Lamy before buying it I’d suggest you do just that. Otherwise, Caveat Emptor! The Vista uses a cartridge/converter system, and Lamy uses a propriety c/c system. This means you have to use Lamy cartridges or converters. This limits your cartridge ink color selection, but you can always flush out your old Lamy carts and refill them with whatever color you want. The Vista uses the Z24 converter, but I’m presently using a Z26 converter I got for my Lamy Studio. The Z26 fits, but doesn’t come with the plastic bits on the side that lock the converter into place. I haven’t had any leaking issues, but I’d imagine that someone carrying this pen around might want the extra security of the Z24. These pens are inexpensive, and that is largely their appeal. They can be had for around $26. I consider them a pretty decent value at that price. They are durable as heck, and if you are fortunate enough to get one with a good nib you’ll more than likely enjoy the pen. All in all the Vista is a decent pen, and one that I might recommend to a newbie. My only reservation is really the inconsistent nib quality. I’d hate for a scratchy nibbed Vista to turn a newbie off our wonderful hobby. This pen was sent to me for review by Lily at JetPens. I am not otherwise affiliated with them. My Lamy Vista with F nib was the first pen I acquired when I was bit by the FP bug. Although I have since developed a taste for ED pens and piston fillers, the Vista remains one of the smoothest writers I own. Glad you’re enjoying yours! The Vista was really my first real fountain pen, apart from the Hero 332 fake Parker 51. I had an M nib but swapped it with an EF and am using Parker Quink, and it is smooth as ever. Also got a Lamy logo with an F nib that I’m using with the Lamy carts-this one was real scratchy with the same EF nib that the Quink works perfectly with, so maybe it’s the thickness of the ink that causes a problem?